My coffee swap package arrived last week, and it was wonderful!! Chan was my pal, and she did quite the job of spoiling me rotten. It was the perfect pick-me-up during a very stressful week. 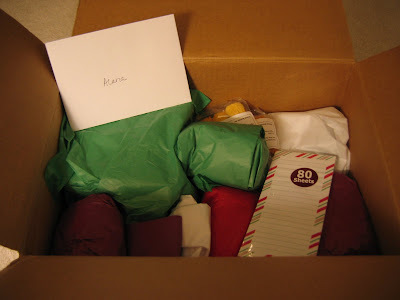 I opened the box to find lots of goodies, all nicely wrapped in Christmas colors. 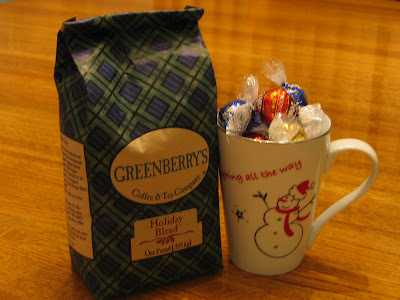 See.... Of course she sent coffee..... A fantastic Holiday Blend from Greenberry's, which is new to me. It's either local, or something we don't have in these parts. And what a fun mug-- Just perfect for my morning java. I love the Lindor truffles, and don't plan to do much sharing with those!! 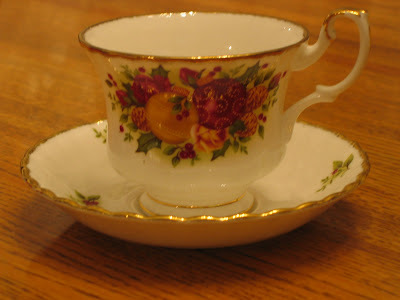 She also sent a beautiful English China cup and saucer with a holiday theme. That will be reserved for my evening cup of tea. The yarn she sent was just fabulous! 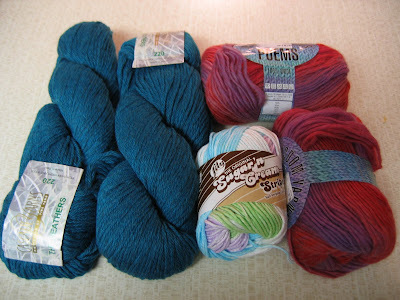 I like using Cascade 220, and there were two skeins of it in a great shade of turquoise. The variegated is a soft wool, and I'm contemplating using it for a felting project, but don't know for sure yet. I thought it would make a cute felted bowl and some felted coasters. I can hardly wait to use the Sugar & Cream stripes. I haven't been able to find it around here, and I've really wanted to get my hands on some. 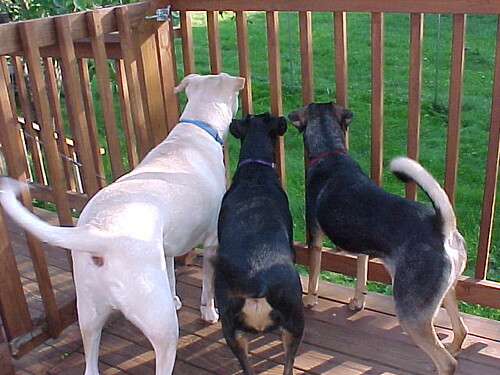 I've gotten some from a couple of my secret pals, which makes me very happy!! I kept unwrapping one fun thing after the other, and couldn't believe all that she sent. There was a candy stripe trimmed note pad, and some cute little napkins. The bell tree ornament is gorgeous, which does not show up in the photo. It's just encrusted with sparkle and glitter!! I'm in love with the crochet covered tape measure. It went straight into my "traveling" knitting bag, and has already been put to good use. Sweet Mugsy even sent some peanut butter treats for my two doggies, which they love. 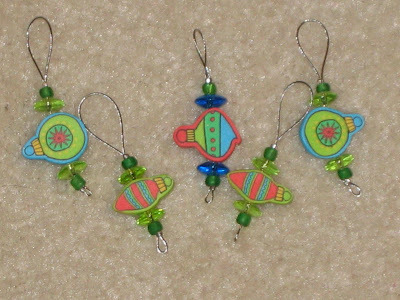 I had to take a close-up of the stitch markers-- They are TOOO cute for words!! Are you jealous?? Well you should be, because they are really special! I can hardly wait to use them for my next circular project! This swap was so much fun! Chan was a great spoiler who not only sent a wonderful package of fun things, but she also kept in touch with me, and we had a great time emailing back and forth. We read each others blogs, so she was keeping in touch with me both as a regular blog friend as well as anonymously, and she never made a slip! I couldn't have been more surprised to see who my pal was! Great package! Of course, Chan is a good spoiler... lucky you for getting her as your partner! Have a wonderful Christmas just in case we don't chat before then. 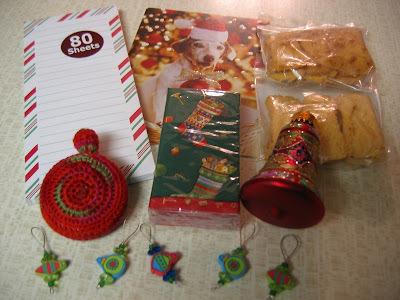 Great package--what a pre-Christmas gift to get! Those stitch markers are too cute! I'm so glad it was all well-received. Mugsy was glad to share; he LOVES treats from our only dog bakery. Greenberry's is semi-local. I think it's a small, regional chain. I just love their plaid bags! I've not had a bad coffee from there yet, so I hope you enjoy it! What a great package! The stitch markers are so cool! Chan did great - super package!!! That Poems yarn is a wonderful yarn to work with. I made some felted coasters & a coffee cozy from some and its superb!!! OMG Alana... you are amazing! i got my box today and opened after we got home from the Bruins game & doggy errands... I LOVE EVERTHING and can't say thank you enough - you really nailed me, right down to the PERFECT post it notes... and that needle holder you made is AWESOME!!!!!!!! THANK YOU - I will be blogging about it soon (hopefully tomorrow)... you are awesome!